Scientists and science fiction writers alike have dreamt of aircrafts that are propelled by beams of light rather than conventional fuels. 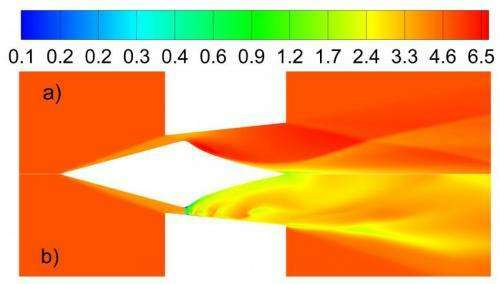 Now, a new method for improving the thrust generated by such laser-propulsion systems may bring them one step closer to practical use. Currently, the maximum speed of a spacecraft is limited by the amount of solid or liquid fuel that it can carry. Achieving higher speeds means that more fuel must be burned—fuel that, inconveniently, has to be carried by the craft and hefted into space. These burdensome loads can be reduced, however, if a laser—one located at a remote location, and not actually on the spacecraft—were used to provide additional propulsive force. A number of systems have been proposed that can produce such laser propulsion. One of the most promising involves a process called laser ablation, in which a pulsed laser beam strikes a surface, heats it up, and burns off material to create what is known as a plasma plume—a column of charged particles that flow off the surface. The outflowing of that plasma plume—essentially, exhaust—generates additional thrust to propel the craft.